So, I've been painting a lot of botanicals lately for a meadow project I'm working on and they all involve many layers of glazing. 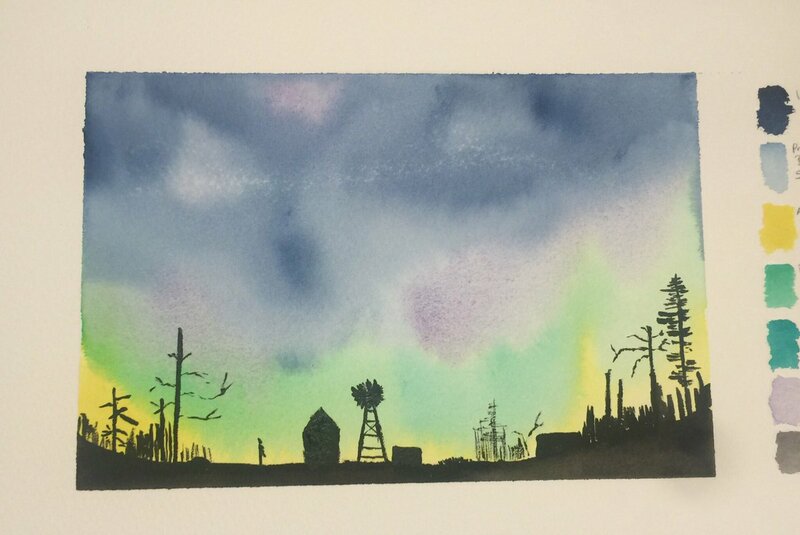 Whilst they are drying, I've taken to doing sketches based on the aurora borealis - this has kind of now become a thing and it's had a lot of attention on Twitter so I'm now hashtagging them as the #svalbardseries - they are silhouettes based on actual Google Street View images from Svalbard, but with imaginary backgrounds. Here are some examples, thus far - two based around the town Longyearbyen and one more rural based near to a mining town. 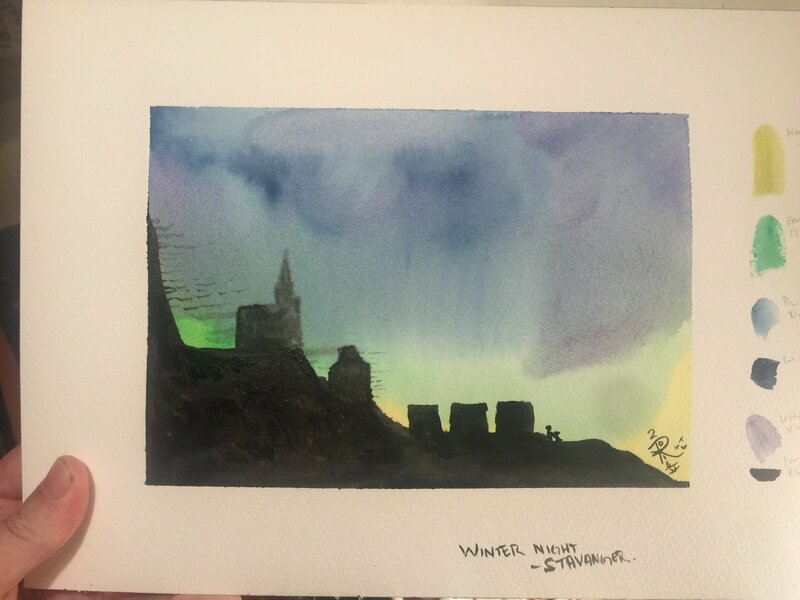 Important to note that St Cuthbert's Mill kindly gave me a block of Saunder's Waterford paper to review, gratis, and I've been suing it for these paintings and others to really test it out. It is in 140lb cold-press (CP/NOT) in their 'high-white' colour, which is a very pure, bright white. Watercolour on paper. Copyright (C) 2016, The Spindoctor. CC BY-SA-4.0. Saunders Waterford 140lb "high white" cold-press paper. Artist-grade paints by Winsor & Newton in Indigo, Prussian Blue, Aureolin, Phthalo Green YS and BS, Ultramarine Purple and Ivory Black. This was originally going to be 'Gaia's daughter', but I figure Jörð is more appropriate. The miner is stood to the left of their house, his daughter is held in his arms. Watercolour and gouache on paper. Copyright (C) 2016, The Spindoctor. CC BY-SA-4.0. Artist-grade paints by Winsor & Newton in French Ultramarine, Aurora Yellow (discontinued, 1997), Dioxazine Violet, Phthalo Green YS and Ivory Black. Spattered with Designer's Gouache (Winsor & Newton) in Zinc White. Reflecting the aurora in the snow on the ground worked out really nicely in the end. I did the spattering effect with one of those spattering brushes that looks like a bottle-brush and you turn the handle - makes for a lovely fine spray! Artist-grade paints by Winsor & Newton in Hansa Yellow, Emerald (discontinued, 2002), Prussian Blue, Indigo, Ultramarine Violet and Ivory Black. Don't be confused by the name at the bottom - that was me noting down what to paint next (i.e. the painting above this one!) 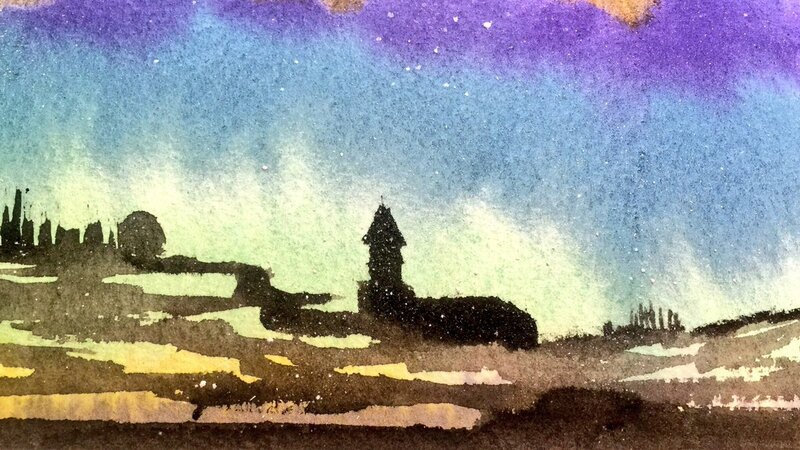 but I was going to paint Norway - this was prior to deciding to stick to Svalbard.